Detailed programs and data for all the data applications are available. See mmaprograms.html. This is a potentially great resource for instructors and readers. All errors in the book are posted as we become aware of them. See mmacorrections.html. For less serious misspellings and punctuation errors see mmamisspellings.html. The book assumes a basic understanding of the linear regression model with matrix algebra. It is written at the mathematical level of the first-year economics Ph.D. sequence, comparable to W.H. Greene Econometric Analysis (2003). 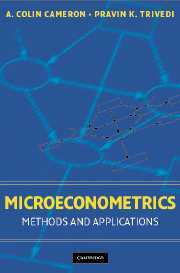 While some of the material in this book is covered in a first-year sequence, most of the material in this book appears in second year econometrics Ph.D. courses or in data-oriented microeconomics field courses such as labor economics, public economics or industrial organization. This book is intended to be used as both an econometrics text and as an adjunct for such field courses. More generally, the book is intended to be useful as a reference work for applied researchers in economics, in related social sciences such as sociology and political science, and in epidemiology. The models chapters have been written to be as self-contained as possible, to minimize the amount of background material in the methods chapters that needs to be read. For the specific models presented in parts four and five (chapters 14-23) it will generally be sufficient to read the relevant chapter in isolation, except that some command of the general estimation results in chapter 5 and in some cases chapter 6 will be necessary. Most chapters are structured to begin with a discussion and example that is accessible to a wide audience. For instructors using this book as a course text it is best to introduce the basic nonlinear cross-section and linear panel data models as early as possible, skipping many of the methods chapters. The most commonly-used nonlinear cross-section models are presented in chapters 14-16, and require knowledge of maximum likelihood and least squares estimation, presented in chapter five. Chapter twenty-one on linear panel data models requires even less preparation, essentially just chapter four. Table 1.2 provides an outline for a one-quarter second-year graduate course taught at the University of California - Davis, immediately following the required first-year statistics and econometrics sequence. A quarter provides sufficient time to cover the basic results given in the first half of the chapters in this outline. With additional time one can go into further detail or cover a subset of chapters eleven to thirteen on computationally-intensive estimation methods (simulation-based estimation, the bootstrap which is also briefly presented in chapter seven and Bayesian methods); additional cross-section models (durations and counts) presented in chapters seventeen to twenty; and additional panel data models (linear model extensions and nonlinear models) given in chapters twenty-two and twenty-three. At Indiana University - Bloomington, a fifteen-week semester long field course in microeconometrics is based on material in most of Parts 4 and 5 (chapters 14-23). The prerequisite courses for this course cover material similar to the material in Part 2 (chapters 4-10).